We’re not sweet eaters as such. That’s not to say we don’t like sugar ‘n’ spice and all things nice, it’s just that these days we might as well miss out the middle man and simply staple any slices of cake straight on to the waistline. We do actually buy a bar of chocolate every second week and with an iron-willed discipline limit ourselves to two squares which are eaten with relish post lunch. However, a few years ago friends, who throw caution to the wind in the sweetie eating stakes, introduced us to the pleasures of turrón and now this Christmas treat from Jijona is a regular addition to our cupboards over the festive season. It’s probably this simple cake that sparks the first feelings of Christmas on Tenerife as a dizzying array of boxes and varieties take the place of the rather more healthy fruit selection in the local supermarket. And the selection is dizzying. I’ve watched Canarios, fingernails being chewed furiously, trying to decide for upwards of 30 minutes which flavour to opt for. We’ve tried caramel flavour, coconut flavour, cherry flavour and cream. But we always return to the classic yema tostada made from almonds, honey and egg yolk. 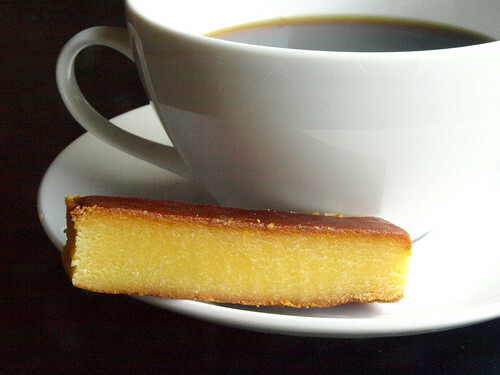 Round about 3.30pm, when creativity and enthusiasm is flagging badly, a cup of coffee accompanied by a finger slice of yema tostada provides just enough of a boost to get us through another three to four hours work. In that respect it’s not a treat at all, it’s an essential Christmas work tool…honest. The Real Tenerife vs Theme Parks. I recently read a blog in which the blogger posed the question, what is it about Puerto de la Cruz that makes some people recommend it so frequently on forums such as Tripadvisor. After all, you can number the ‘what to dos’ of the resort on the fingers of one hand, particularly for teenagers, whereas the resorts of the south are jam packed with theme parks. It got me wondering how many holidaymakers from the UK now rely on manufactured entertainment in order to enjoy themselves? I can honestly say that in all our years of traveling, Jack and I have never once, even remotely, considered what a place had to offer in terms of things laid on for visitors before deciding to travel there. In fact, if anything that would be a factor against going. Our very good friends, the Largies’ have been coming to stay in Puerto de la Cruz ever since we moved here. To begin with they just brought their then 14 year old daughter and her friend but they had so much fun that next time the party had grown to include their 17 year old son and his friend. Now completely hooked, they all arrived again the following year when the offspring and their friends were16 yrs and 19 yrs respectively. In fact, they all enjoyed it so much and wanted to come back so frequently that we had to put a stop to it as we were having far too much fun and not actually working for a living – a balance that can only lead to one destination – Skintville. In all the times the Largies came they only left the resort twice – once to go to Mount Teide with which they were blown away, and once to go to Aqualand which they thought was an overpriced disappointment. I have no doubt they would have enjoyed Siam Park, on the other hand the waves at Playa Jardín gave them just as many adrenalin-packed thrills and spills and didn’t cost anything. They may have enjoyed a visit to Veronica’s or Starco’s but instead they danced the nights away in the streets at Carnaval and in the local clubs where they met a cosmopolitan set of new friends. Perhaps Castillo de San Miguel would have been a novelty for them but instead they played Russian roulette over plates of pimientos de padrón in Bar Louis and practised their Spanish over ordering postres and drinks. I don’t consider that Puerto de la Cruz is the only resort on Tenerife and it certainly won’t suit the majority of visitors who seem to want their sun, sand and sea accompanied by cabaret and theme parks. But I’m not convinced that everyone needs their entertainment to be packaged, admission charged and sold as ‘get your fun here’, regardless of what age they are…are you? As we ate breakfast on the terrace yesterday morning, the sun was being very coy. Typical. Pretty much all summer the default setting for our weather has been clear blue skies and sun, sun, sun. 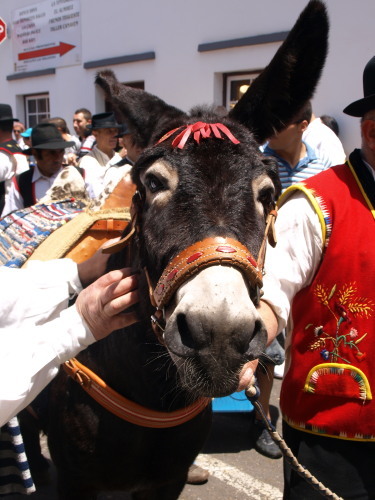 But Friday was the start of the annual craft fair of Pinolere in the hills above La Orotava and if belly of the donkey was going to make a re-appearance anywhere, it would be there. 800 meters above sea level and hemmed in by barrancos to the east and west, Pinolere is a community of some 700 inhabitants living in the shadow of Tenerife’s mountainous spine, and more often than not, beneath a sea of clouds. It may mean that Pinolere is never going to topple Playa de Las Americas as Tenerife’s number one tourist destination, but the clouds bring high humidity ensuring that everything here grows in abundance. But yesterday, as we snaked our way high above the coast of Puerto de la Cruz, the sun finally broke free and the clouds ran for their lives leaving another glorious day in the La Orotava Valley. Even though it was barely 11.30am when we arrived, the car parking was choc a bloc and we ended up parking on a small dirt track which led off to fincas set amongst the vines of the valley. Bemoaning the fact that we hadn’t thought to bring ropes and crampons, we toiled up a near-vertical street, back to the site of the craft fair wishing that the clouds had chosen to descend as sweat trickled down our backs. The last time we visited the fair, the trademark bruma (cloud) had entirely obscured its location but yesterday, under clear skies, the true beauty of our surroundings was nothing less than awesome. The emerald, forest-clad slopes of the upper La Orotava Valley rose to dizzying heights in a shimmering heat haze beyond the thatched roofs and vines of the hamlet. For the majority of Pinolere’s inhabitants, the land provides their livelihood and allows them to be almost entirely self-sufficient. For generations, the community have been basket weavers, iron workers, charcoal producers, carpenters, farmers and muleteers. 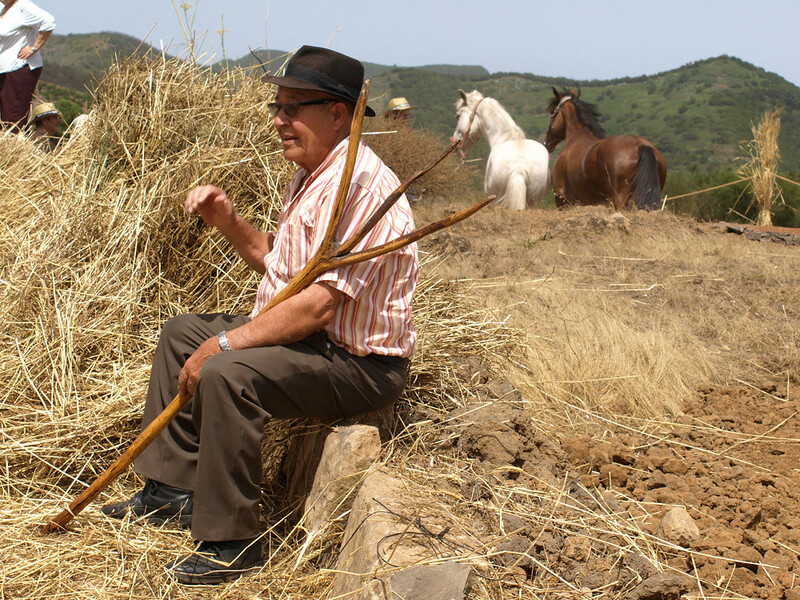 It’s only recently that they’ve ceased to construct their homes in the traditional manner of many of the country dwellings of Tenerife; walls of dry stone roofed with chestnut wood entwined with branches and then thatched with straw. 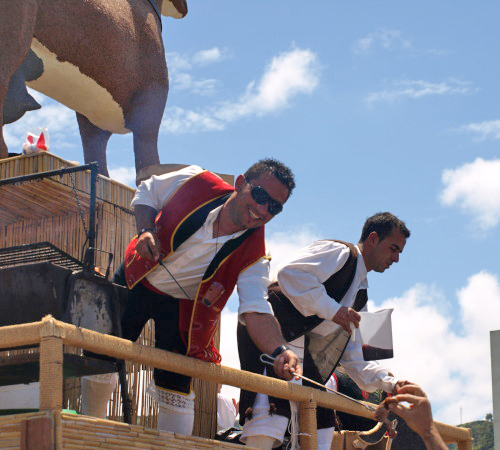 25 years ago Pinolere made plans to introduce a new aspect to their local fiestas and came up with the idea of showcasing the wide range of crafts and skills that they held. 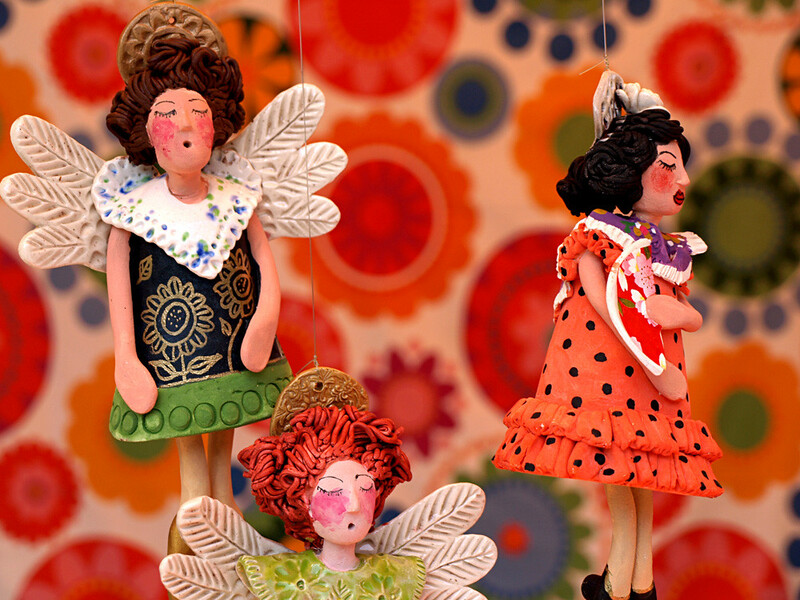 Calling it ‘The Day of the Traditional Canaries’, they brought together all the craftspeople from the local area and invited them to exhibit the best of their products. 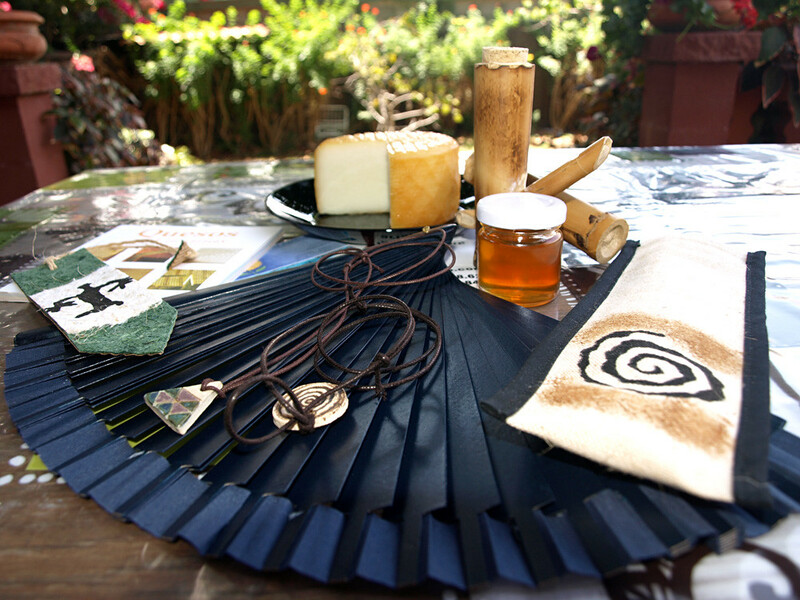 Over the course of the years that event has grown from a local fair to the Canary Islands’ largest showcase for crafts made from traditional produce. 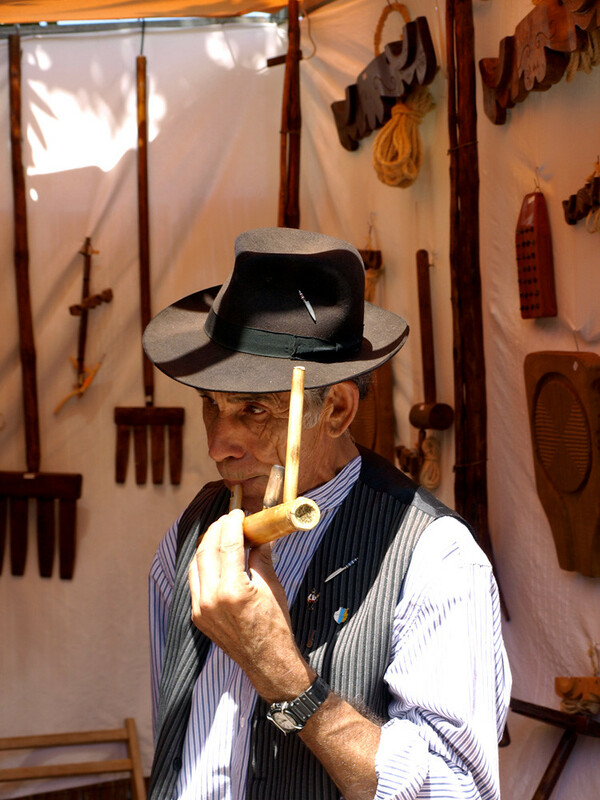 The Pinolere Craft Fair is set in 10,000 square metres of terraces and pathways that meander as randomly as the surrounding barrancos and contain hundreds of stalls filled with jewellery; woven baskets; clothes; hand carved furniture; ceramics; pottery; toys; herbs and spices; cheeses; jams and mojos; cakes; glassware; cane furniture; iron and copper ornaments…the list is endless. As we made our way up level after level filled with stalls, the stone-built thatched houses provided small exhibitions on the history of wheat production in the area and a short-lived refuge from the hot sun. Arriving finally at the top level we reached the welcome sight of a large guachinche where the aroma of sizzling pork pinchos (kebabs) and the sight of condensation running down the side of cold beer bottles was too much to resist. Finding a small section of vacant wall we sat down to enjoy our pinchos and beer and peruse our collection of purchases while gawping at the incredible scenery. It’s probably a good job that Pinolere doesn’t enjoy this kind of weather continuously or the fields of wheat, vines, vegetables and cereals would soon get replaced by villas and apartments and we’d have lost something really, really special. I wasn’t really too surprised to hear that yet another yellow alert for high temperatures in Tenerife had been issued by the Spanish Met Office last week. After all, Día de la Trilla was fast approaching. For reasons beyond my comprehension, some events on Tenerife are linked inextricably with certain weather conditions. 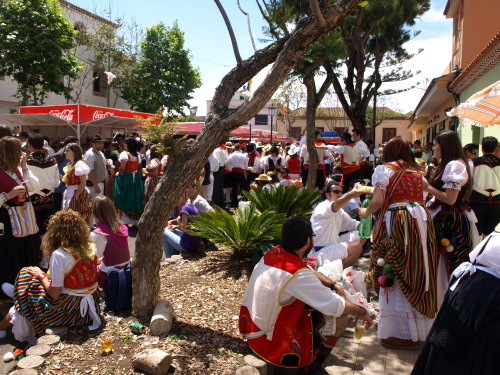 For example, Carnaval season pretty much guarantees rain; Puerto’s Fiesta Del Carmen simply couldn’t happen on anything but the most glorious of days and Día de la Trilla seems to need blisteringly hot days before a single straw of wheat can be threshed. Last year we set off into the hills of Tenerife and found temperatures in excess of 40°C waiting for us in El Tanque. This year, with the tail end of a calima still in evidence, the mercury was only somewhere around the 39°C mark as we arrived at the site of what is soon to be an agricultural eco-museum. A fancy new concrete car park greeted us where previously only fields provided space for the mainly 4x4s and horse boxes that gather in El Tanque for the annual traditional wheat gathering and threshing. Unfortunately, the work being undertaken to create a centre where traditional farming methods are showcased meant that the venue for the day’s fun was largely a building site and certainly wasn’t going to win any beauty prizes. But neither the surroundings nor the excessive temperatures could detract from the festive air as we made our way past stalls selling home made produce, hand made ornaments, Bonsai trees and naturally, lots of home made bread, to a soundtrack of folk music blaring from speakers across the ground. Horses, oxen and people all mingled under a heat-leaden sky, blinded by the glare off the gold mountain of wheat that filled the small era, or threshing circle in which most of the day’s action would take place. 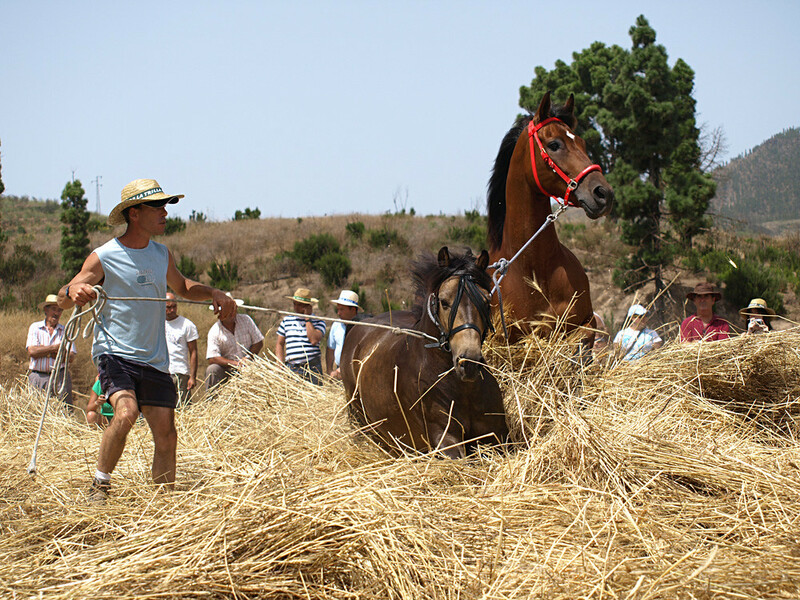 Barely had we got video and camera lens in place when the first of the teams of horses arrived and the threshing began. Teased from the centre of the era, the two horses cantered in circles, knee deep in wheat, or in the case of the smaller of the two, belly deep. As the level of the sea of wheat visibly fell, pitchforks worked to replenish the bales. A second team of horses took over to bring renewed energy to the proceedings and slowly, the wheat levelled out and broke down enough for the big guns to take over. Enter two teams of oxen. 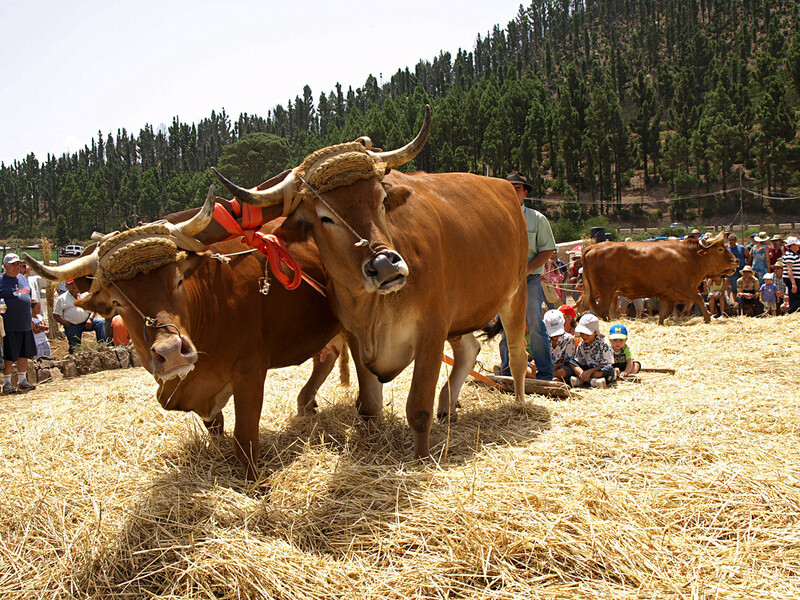 Beautiful, placid creatures with big cow eyes and haunches the size of bulldozers, the oxen stood patiently while they were tethered to heavy wooden threshing boards before setting off effortlessly, the boards, a driver and several squealing local children in tow for what in El Tanque, passes for a fairground ride. Round and round the oxen were driven, stopping to take on board fresh young passengers, until the wheat was fine enough for winnowing to begin and the fine chaff to be whisked away on the breeze leaving the wheat to be gathered. But we didn’t stay long enough to see the process through to its conclusion. With my nose already twitching from the hay dust, we made our way to the busy beer tent where bodies vied for space under the limited shade of its awning. After downing possibly the most refreshing beer I’ve ever drunk, we made our way past the guachinche with its burgeoning dinner line and headed to the car, a picnic and the sanctuary shade of the local pine forest. I think it’s fair to say that our first couple of Christmases on Tenerife were not quite what I’d hoped they’d be. The first year we’d only been here for a couple of months when Jack’s family descended on us en masse – bless them. Not wanting Jack and I to be lonely on our first Christmas in a foreign land, mum, sister and brother-in-law and their two teenage sons and Aunty Barbara all arrived four days before Christmas to stay with us in our rented house. All was going swimmingly and remarkably well considering 8 of us were sharing 2 bedrooms and 1 bathroom until we went to Loro Parque the day before Christmas Eve. It was raining and we were all dressed like yellow parakeets in our Loro Parque rain capes. We were flying (ouch) to get to the parrot show before it started when Aunty Barbara slipped on the wet tiles and broke her wrist in three places. Pins were inserted into Barbara’s arm on Christmas Eve, party frocks stayed in the suitcases and the mood was sombre. The following year we had our friend Jo coming to stay with us and decided to make up for the year before. Dressed to the nines, we jumped on the bus and got off at Poco Loco, a Mexican restaurant that we’d long wanted to try and had settled on for our Christmas Eve dinner. Walking down the dirt road leading to the restaurant we thought the lighting was a little subdued and got to the door to find that they were closed. We were gutted…and hungry. Plan B kicked into operation and we walked down to town to peruse other menus. The next 40 minutes or so was a nightmare as restaurant after restaurant was closed or just closing its doors as we got there. We wandered incredulous through empty streets as if in some kind of play where everyone else had a script. 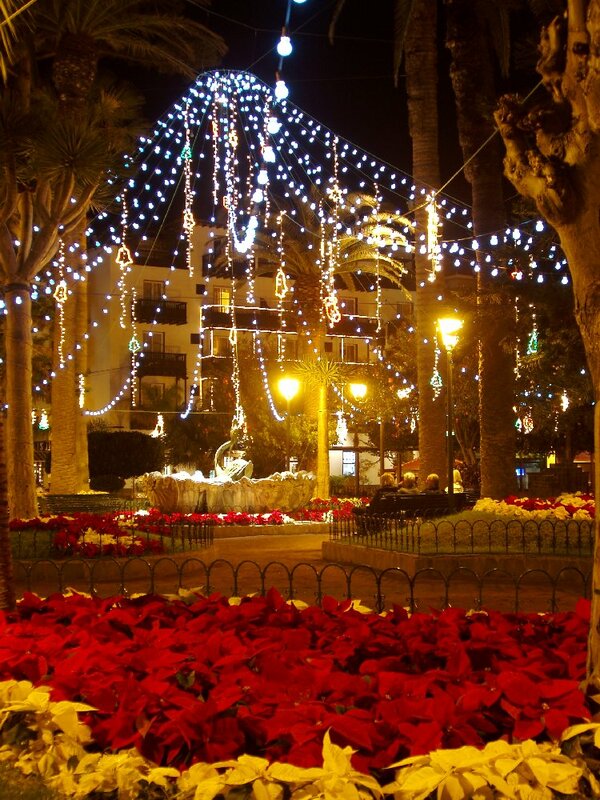 We even began to doubt that this was Christmas Eve; we’d never seen the town so quiet. Eventually, the only place we could find that was open was the Chinese at San Telmo and we ended up having an overpriced and distinctly average meal there. Never mind, we mused, we’ll just have to party instead and headed into the night in search of the hot spots. But the nightmare continued. Bars were either closed or closing and apart from a handful of motley German tourists, no-one was around. Finally, we gave up and headed to the Beehive, a Brit bar, on Calle La Hoya, where the only party in town was happening. Admittedly we had rather a good time. In fact, we had such a good time that Christmas Day was ruined by the hangover from hell. 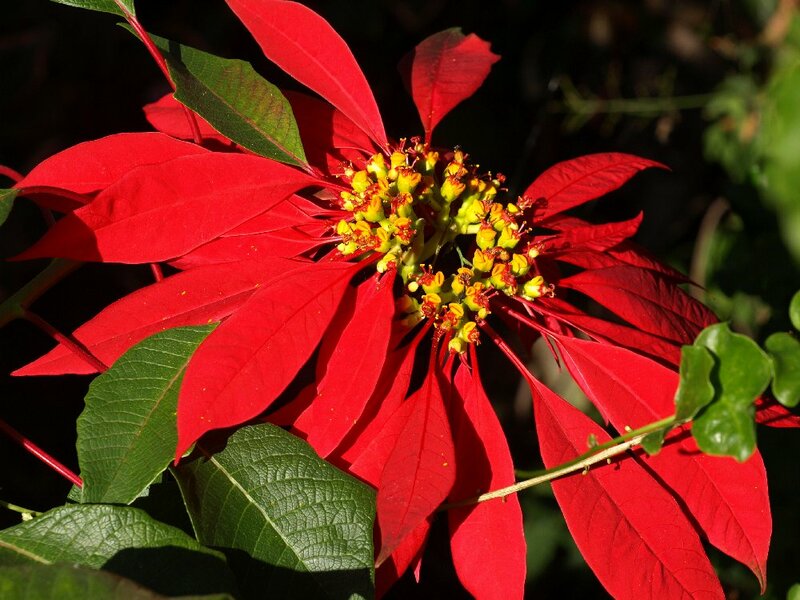 The moral of this story is simple…if you’re coming to Tenerife for the Christmas season, make sure you know what you’re likely to find, and not find, when you get here. Other wise, you could end up going home with a suntan and the feeling that somehow, you missed out on Christmas altogether.